Wearable tech artist/educator. Maker of things. 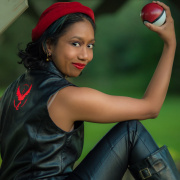 Costumer, cosplayer, and crafter. 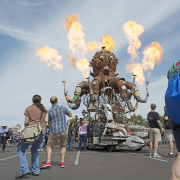 A few SparkFun folks will be heading to Maker Faire Bay Area! 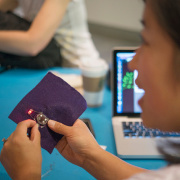 Join us for SparkFun Live on Tuesday, April 21st! Time to get ready for the next episode of SparkFun Live. Angela from the Education Department visited F.I.T's Digital Spa Maker Camp to present a workshop on LilyPad and e-textiles. 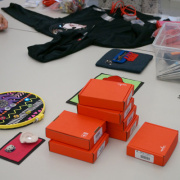 Here are a few tips for creating your e-textiles workshop and activities. We are actively working on the Windows 7 and 8 driver issues, but don't have a solution for you at the moment. This version of LilyPad will not show on a port if the on board power switch is set to OFF. Try double checking that it is in the on position and see if that makes it visible. AAA holders are a great option too, especially because those are a lot easier to find locally than some of the specialty batteries like LiPos. 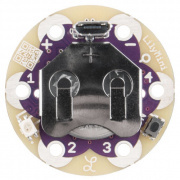 One thing to make sure to check if you have a JST terminated battery holder is that you disconnect it when you connect to a USB power source while programming boards that have charging circuits built-in (such as LilyPad). I've heard tips about being able to find coin cells in dollar/discount stores too. They can be quite a pain to acquire with the shipping restrictions put in place in the last couple of years for manufacturers and resellers. 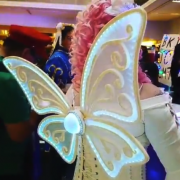 I actually had a lot of conversations about this at Denver Comic Con this weekend when people were asking how I powered my light up fairy costume. I installed batteries in strategic places on a thigh band I could reach instead of the more 'intuitive' placement inside my light up wings because it would be hard to reach them in case of emergency. I also tend towards using power banks that include an enclosure (and typically have a larger capacity than those exposed LiPos) which can be a little safer in costume applications. Micro USB connectors are also a lot easier to unplug quickly than the JST connectors if you need to do it fast. I'm a fire spinner in my spare time so luckily most of my wardrobe is natural fibers because of potential melting hazard. A good practice to use in all costuming that includes potential exposure to sparks. Keep away from heat and moisture - Keep your LiPo battery away from environments that will damage it. Do not immerse a LiPo battery in liquids. Remove the battery from your project if it needs to be washed. Do not use or store the battery near any source of heat. To secure a battery to your project, velcro is a temporary option or sew into a pouch or place in a plastic enclosure. Never iron or hot glue on or around a LiPo battery. Strain relief - One of the down sides to using these LiPo batteries is their fragile power connections. These type of batteries are manufactured for a permanent install in devices, and not being removed often as can sometimes happen with wearables. It can be easy to accidentally pull or break the power wires from the terminals on the safety circuit built into the battery. You can provide strain relief to the wires by placing them to the side and securing with electrical tape - this will help with strain on the connection to the battery when pulling on them to remove. Nate shows some tips for strain relief in his LiPo Battery Care article. Inspect battery before each use - short circuits or damage to LiPo batteries may not always be noticeable - check the battery for puffiness, heat, or other changes. If the battery looks damaged, remove immediately. I'm currently writing a tutorial specifically about powering LilyPad projects, so stay tuned for that soon! For more resources to help guide which battery to choose for your project check out our Battery Technologies Guide. We also have a guide that helps you calculate power considerations for e-textile projects Powering LilyPad LED Projects which includes a chart of approximate run times on different types of batteries and combinations of LEDs. For some cool behind the scenes, Nate wrote an article on How Lithium Polymer Batteries are Made. There are four LEDs, one under each letter. I used Heat'n Bond iron-on double sided adhesive, though you do have to be a bit careful with acrylic felt cause it can melt if you get the iron up too hot. I think I just used hot glue to attach the logo to the hat, it's held up over a few years now. 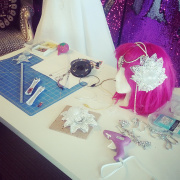 I've got a few extra hats in my studio that I was going to use for a tutorial, maybe it's time to dig those out! 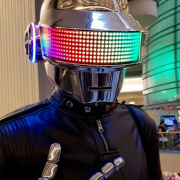 Here are two resources that aren't the exact project but go over some helpful techniques Insulation Techniques for E-Textiles and Planning a Wearable Electronics Project. That hat is one of my favorite builds, there isn't a full tutorial, but you can see some detail photos in the light sensor hookup guide. If you'd like I can grab some of my illustrations/artwork for planning and add them to the tutorial for reference. This tutorial was created to go with our hand-sewn project kits, but I'll update the tutorial to reflect sewing machine considerations and possibly do a dedicated tutorial on those techniques. Like any thread, they technically can go in a sewing machine but can have varying degrees of success depending on your machine and tension settings. The bobbin that the thread comes on is not compatible with every machine, but can be rewound on other bobbins. I recommend using it in the bobbin to begin with. One option for protecting the battery is covering with felt. Feldi left the battery holder exposed for demonstration, but in use it is best to protect any exposed components from shorts as you pointed out. You can see a demonstration of this in my tilt sensor project. The conductive thread is also insulated with flexible fabric glue for added protection.